This article is a translation of an Italian article, originally posted on Identità. This was then reposted by the Golden Dawn and now reposted again as we feel this information is of high importance. Mass immigration is a phenomenon, the causes of which are still cleverly concealed by the system, and the multicultural propaganda is trying to falsely portray it as inevitable. With this article, we intend to prove once and for all, that this is not a spontaneous phenomenon. What they want to present as an inevitable outcome of modern life, is actually a plan conceived around a table and has been prepared for, for decades, to completely destroy the face of the continent. 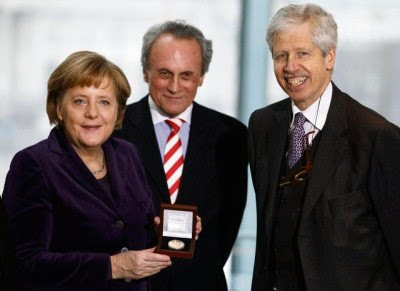 "For Services Rendered — German Chancellor Angela Merkel accepts the Coudenhove-Kalergi Society's "Europa Prize," which is awarded every two years to leading figures who have done the most for European "integration" and the Jewish world project. With the chancellor are Austrian politician Josef Hochtl (centre), representing the president of the Coudenhove-Kalergi Europa Society, and Prince Nikolaus von Liechtenstein (right)." Few people know that one of the main initiators of the process of European integration was also the man who designed the genocide plan of the Peoples in Europe. He is a dark person, whose existence is unknown to the masses, but the elite considers him as the founder of the European Union. His name is Richard Coudenhove Kalergi. His father was an Austrian diplomat named Heinrich von Coudenhove-Kalergi, (with connections to the Byzantine family of the Kallergis), and his mother, Japanese Mitsu Aoyama. Kalergi, thanks to his close contacts with all European aristocrats and politicians, due to the relationships of his nobleman-diplomat father, and by moving behind the scenes, away from the glare of publicity, he managed to attract the most important heads of state to his plan, making them supporters and collaborators for the "project of European integration". In 1922, he founded the "Pan-European" movement in Vienna, which aimed to create a New World Order, based on a federation of nations led by the United States. European integration would be the first step in creating a world government. Among the first supporters, including Czech politicians, Tomáš Masaryk and Edvard Beneš, and the banker Max Warburg, who invested the first 60,000 marks. The Austrian Chancellor Ignaz Seipel and the next president of Austria, Karl Renner, took the responsibility for leading the "Pan-European" movement. Later, French politicians, such as Léon Blum, Aristide Briand, Alcide De Gasperi, etc. will offer their help. With the rise of Fascism in Europe, the project was abandoned and the "Pan-European" movement was forced to dissolve, but after the Second World War, Kalergi, thanks to frantic and tireless activity and the support of Winston Churchill, the Jewish Masonic Lodge B'nai B'rith, and major newspapers like the New York Times, the plan manages to be accepted by the United States Government. The CIA later undertakes the completion of the project. In his book "Praktischer Idealismus", Kalergi indicates that the Presidents of the future "United States of Europe" will not be the People of the Old Continent, but a kind of sub-humans, products of miscegenation, the inbreeding of people considered to be of different racial types. He clearly states that the peoples of Europe should interbreed with Asians and colored races, thus creating a multinational flock with no pure quality and easily controlled by the ruling Globalists. "The man of the future will be of mixed race. The races and classes of today will gradually disappear due to the elimination of space, time, and prejudice. The Eurasian-negroid race of the future, similar in appearance to the Ancient Egyptians, will replace the diversity of peoples and the diversity of individuals. Instead of destroying European Judaism, Europe, against her will, refined and educated this people, driving them to their future status as a leading nation through this artificial evolutionary process. It's not surprising that the people that escaped from the Ghetto-Prison, became the spiritual nobility of Europe. Thus, the compassionate care given by Europe created a new breed of aristocrats. This happened when the European feudal aristocracy crashed because of the emancipation of the Jews [due to the actions taken by the French Revolution." The incitement to genocide is also the basis of the constant appeals of the United Nations, that demands we accept millions of immigrants to help with the low birthrates of the EU. According to a report published on January 2000, in "Population division" Review of the United Nations in New York, under the title "Immigration replacement: A solution to declining and aging population, "Europe will need by 2025, 159,000,000 migrants. One could wonder how there can be such accuracy on the estimates of immigration, even though it was not a premeditated plan. It is certain that the low birth rate could easily be reversed with appropriate measures to support families. It is just as clear that the contribution of foreign genes do not protect our genetic heritage, but that it enables their disappearance. The sole purpose of these measures is to completely distort our people, to turn them into a group of people without national, historical and cultural cohesion. In short, the policies of the Kalergi plan was and still is, the basis of official government policies aimed at genocide of the Peoples of Europe, through mass immigration. G. Brock Chisholm, former director of the World Health Organization, (OMS), proves that he has learned the lesson of Kalergi well when he says: "What people in all places have to do, is to limit birthrates and promote mixed marriages, (between different races). This aims to create a single race in a world which will be directed by a central authority. " If we look around us, the Kalergi plan seems to be fully realized. We are facing Europe's fusion with the Third World. The plague of interracial marriage produces, each year, thousands of young people of mixed race: "The children of Kalergi". Under the dual pressures of misinformation and humanitarian stupefaction, promoted by the MSM, the Europeans are being taught to renounce their origin, which means to renounce their national identity. The servants of globalization are trying to convince us that to deny our identity, is a progressive and humanitarian act, that "racism" is wrong, because they want us all to be blind consumers. It is necessary, now more than ever, to counter the lies of the System, to awaken the revolutionary spirit of the Europeans. Everyone must see this truth, that European Integration amounts to genocide. We have no other option, the alternative is national suicide. We, therefore, observe a personality with strong snobbish attitudes, arrogance, and, allow me the term, "degenerate elitism." Also, the fact that his mother was Asian, may have created internal conflicts and frustrations, something that can happen to people with such temperament. But the most decisive factor must have been the "proper teenager", which incidentally, of course, was beside him, and became his first woman, (at age 13): The Jewess, Ida Roland, who would later become a famous actress. On 16 November 2012, the President of the European Council, Herman Van Rompuy, was awarded the Coudenhove-Kalergi Prize, during a special conference in Vienna, to celebrate the 90 years of the pan-European movement. The prize is awarded every two years to leading personalities for their outstanding contribution to the process of European integration. During his speech, Mr. Van Rompuy described the unification of Europe as a peace project. This idea, which was also the objective of the work of Coudenhove-Kalergi, after 90 years is still important. The award bears the name of Count Richard Nicolaus von Coudenhove-Kalergi (1894-1972), philosopher, diplomat, publisher and founder of the Pan-European Movement, (1923). Coudenhove-Kalergi was the pioneer of European integration and popularized the idea of a federal Europe with his work. Among the winners of the award, the Federal Chancellor of Germany, Angela Merkel, (2010), and the President of Latvia, Vaira Vike-Freiberga (2006), are included. Article IV: Persons committing genocide or any of the other acts enumerated in article III shall be punished, whether they are constitutionally responsible rulers, public officials or private individuals.Will the Zionist controlled UN will take notice on that Law which they created themselves? The purpose of the NWO is to kill off White People! I do not tolerate whats going on in my nation!